Have you got dry, itchy skin with red patches appearing from time to time? Well then you’ve probably got atopic skin! 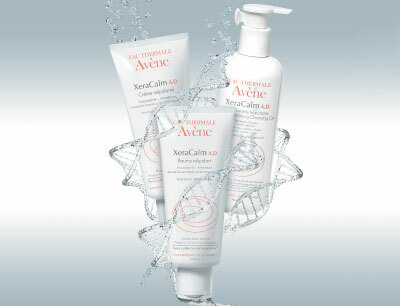 Avène Dermatological Laboratories, specialists in sensitive and intolerant skin care, have developed an entire range of adapted treatments for your daily needs. They innovate through the combination of patented active ingredients with Avène thermal spring water. Now, after 12 years of in-depth research, their new active ingredient, I-modulia, has finally come into being. This breakthrough in biotechnology now helps reduce itching sensations and redness caused by hyper-reactive skin. To complement Avène products and their specialised Xeracalm A.D. range, we now bring you the steps for stopping that itching feeling. Say goodbye to harsh, soap-based products which dry your skin out! It is so important to equip yourself with soothing and nourishing treatments without added fragrances or preservatives that you could be allergic to. This lipid-replenishing cleansing oil is specially formulated to gently cleanse atopic skin types. It has a fragrance-free formula to soothe itchy-prone skin and restore long-lasting defences. The properties of this patented complex act to combat itching, inflammation and microbials (i.e. microscopic bacteria and fungi). ...And it’s suitable for all the family! Cleans and cleanses hypersensitive and allergic skin types. Soap to cleanse intolerant skin, for the face and body. Make sure to use emollient products! They act to restore the skin’s protective hydrolipidic film and counter deep-running dryness. They are, without a doubt, true skin care treatments! Avène Dermatological Laboratories have developed the concept of sterile cosmetics in order to deliver pure formulations without preservatives. These two emollients nourish very dry skin to soothe itching sensations and restore the protective hydrolipidic film for adults, children and infants. Anti-itch cream to restore the lipid layer on very dry, atopic skin. Balm to soothe dry, itchy skin, for the whole family. Drawn directly from its source, Avène Thermal Water is the special ingredient in Avène treatments. It is an all-in-one, must-have treatment combining soothing, anti-irritant and softening actions for your skin. Finish off your skin care routine with a soothing spray of Avène Thermal Water to give your body that gentle relief it needs! It soothes itching sensations so your skin can heal and protect itself!